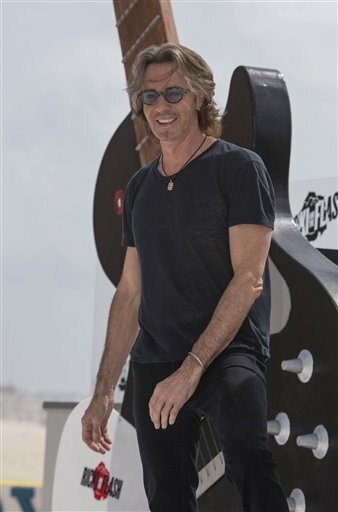 Rick Springfield has not only been guest starring on TV shows, he’s also been a featured artist on other performers’ albums. Here he is with Australian singer, Cleo Alexandra, 22, whose new EP was just produced by Keith Olsen (a producer of RS’s “Working Class Dog” album). The first video had kind of a creepy stalker vibe to it that distracted from the song, but you can appreciate the song much more in the studio version (below). It could be that the stalker vibe was intentional, as it starts out with a view from the outside of a house and then shows RS’s head in a baseball hat and sunglasses floating on the screen as if he’s lurking behind the curtains. If that’s the case, then the video succeeded in its mission. Cleo Alexandra has a beautiful, sultry voice in this different take of Men at Work’s “Who Can it Be Now,” plus it’s really cool to see RS recording his part of the song in his studio. The other collaboration is with Jimmy Martin, a rock artist and producer from Luxembourg. He features Rick Springfield (who he called his mentor in a recent Facebook post) in a duet of RS’s 1984 hit “Love Somebody” on Martin’s “The Duets” album, which was released in November 2018 (though the song was recorded a few years ago). The RS appearance in this video is concert footage, which of course is always fun to see.